In 2001 Fuchsia Dunlop's book, 'Sichuan Cookery', was published. This showed a distinctively different cuisine to the normally Cantonese fare that most British are exposed to. The book describes a region with a deep culinary culture. 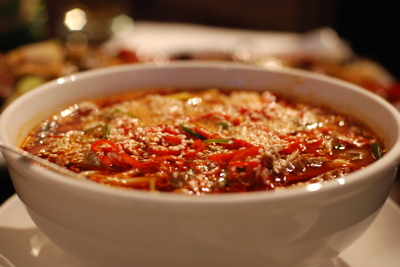 Dishes are famed for their spicy heat, with Sichuan peppers as well as red chillies used and their effects, such as numbing or tingling, used in the vocabulary of taste. Dishes also use many varying and contrasting tastes and textures together. I should've tracked down the ingredients and cooked some the dishes . . . I didn't. 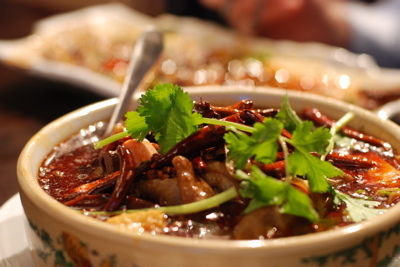 Luckily London now has some Sichuanese Restaurants. I've been to Snazz Sichuan, the restaurant in the New China Club, in Kings Cross, twice over the last couple of months. The first time was with a bunch of London foodie types and I arrived after ordering had already taken place. It all went by in a whirl but I remember it being extremely tasty, the heat gradually building and the bill being remarkably low. I also remember there were some quite unusual animal bits on the menu. I knew I had to pay another visit, this time with Ben. As well as my fellow blogger, I was also joined by Paul and his girlfriend Joanna. Ben and I examined the menu and in a meeting of minds picked out some dishes, mostly bits of pig. Joanna was somewhat alarmed by the prospect of very hot food as well as ears and tails and blood and stuff. We ordered some bitter melon and some cucumber too. So to mitigate the heat, in theory. In order to keep things calm and ensure you concentrated on the food, the restaurant also saw fit to play James Blunt in the background. We encountered this kind of thing at Anthony's. Jeez, what is it about James Blunt (deservedly rhyming slang in parts of London) and restaurants? This is 'Strange Flavour Rabbit'. An appendix in Dunlop tells me that the strange-flavour is a harmonious mix of salty, sweet, numbing, hot, sour, fresh-savoury and fragrant notes. Indeed . . . and it was delicious. It was served cold and nuts and sesame seed provided crunch. These pigs ears were glutinous and crunchy . . . as with last time I had pigs ears I had to stop myself thinking about my own ears. This dish of cucumber with garlic was to provide welcome respite when things started heating up later on. 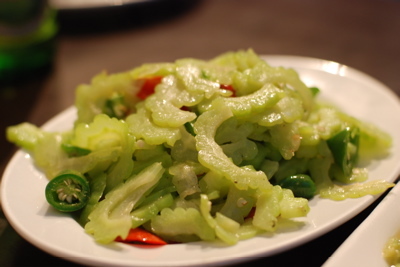 This was another cool and crunchy dish but the melon was bitter, not sweet, with chillies and peppers lurking, ready to pounce. I didn't take a picture of the supernice Guong Po chicken. The central ingredients are chicken, chilli and peanuts but that doesn't capture the glorious look and taste of the dish . . . it's a mite sweet and sour, hotter than any of the preceding dishes but still a beginning really. This was one of the more conservative dishes compared to the more offally, hotter things and was a crowd-pleaser. Bass with pig blood - who would've thought it? The blood in the picture are those photogenic brown blocks. They're much lighter, than say, black pudding, they're not salty and they're soft and slightly crumbly. The heat stepped up another notch. Sichuan peppers both here and in earlier dishes were notable because of their citrus taste as well as their heat. Even if you've read about them it's nicely unfamiliar when you first taste them. These 'fire-exploded kidneys flowers' really turned up the heat. 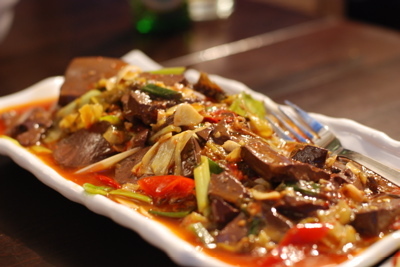 The kidneys are cut in a special way and then quickly cooked at high temperature to unfurl them. The dish consists of the 'flowers' and an enormous amount of Sichuan peppers - look at them glistening, red for danger. We thought we'd ordered another dish, but it hadn't arrived . . . we nudged the waiter and a big bowl of pigs tails soon arrived. And along with the tails . . . was that ham shank? We picked up a block of pink meat and asked the waiter. Ah no, that was luncheon meat, he explained. Spam with everything then. I think it was at this point that I thought I'd just crunch into a dried Sichuan pepper and see what it was like. I'm really not very good with hot foods so I don't know why I did it. It might have been the Tsing Dao beer I'd been glugging. Reader, it was almost psychedelic. I started sweating, I became pleasantly dizzy, endorphins flooded my body and I could've sworn there were flashes of light. All of this provided much entertainment for my dining companions. Would I do it again, hmmm . . . not sure. Ben recounted to me an episode of the Simpsons where Homer eats a very hot chilli and hallucinates. Ah, here it is . . . Indeed, we are on a quest for knowledge. With steamed rice and beer this ample meal came to under £30 a head. Remarkably good value for this level of technique and such a fun and tasty experience. Isn't one of the supposed side-effects of super-spicy food a high-pitched whining noise? Maybe the James Blunt was a mass hallucination...? 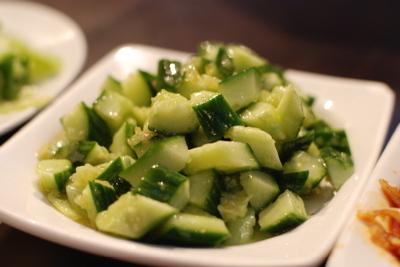 I think the garlic had been softened slightly in oil before being tossed with the cucumber. It's unexpected but very tasty actually. I wonder whether one could use this combination well in a western menu? I'm from Vancouver, Canada originally and there's a massive mainland Chinese population there. Most Chinese restaurants are sichuan, so I'm quite exctied to see it spreading through London as well, albeit slowly! Apparently this place also does a steamboat if you ask nicely, although its not on the menu. Given your recommendation i think i'll go for a visit, thanks! Yes Bar Shu also serves very interesting szechuan food, I can confirm. The only problem with the peppercorns is that it's impossible to taste any wine.... best stick to beer. We first went to Snazz Sichuan for my wife's birthday last June 2007, and have become addicted. The food is fantastic and the waiting staff are very ready to help explain the stranger items on the menu. I too also hallucinated on my first visit!